Are you on our FREE Monday Meditation Musings email list? This is a FREE weekly email designed to provide an inspirational and meditative kick-start to your week .. a little meditative nourishment! The past few weeks having been particularly challenging as I, and my family, have tried to deal with the loss of a loved one. Loss, sadness, anger, discontent, frustration .. a tidal wave of emotions. And I know we are not alone .. this is the human experience and something we all share. Over the years of sitting, and noticing and returning, I have come to understand that whatever my emotions are, both in meditation and in life .. that I will be ok. That the best I can do for myself is remain open and allow intense emotions to be present, to recognise that the sadness is real, and natural, and truly part of me and this moment in my life ..
Interestingly, in my meditation studies this week, I found myself reading about RAIN – a really insightful tool for helping us face strong emotions in our meditation – and beautifully outlined in the book; Fully Present: The Science, Art, and Practice of Mindfulness by Susan L. Smalley, PhD and Diana Winston. The acronym and practice known as RAIN was originally created by the Insight Meditation Society teacher Michele McDonald and I cannot believe that I have only just found it! 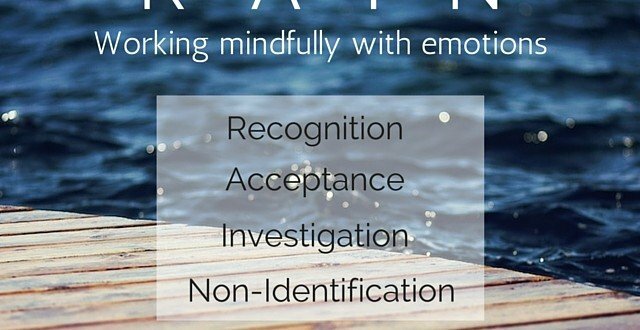 The traditional mindfulness approach to emotions in to recognise – feel them fully – and then let them go. We view emotions as simply ‘energy in motion’ .. therefore temporary and passing through us almost like a weather pattern. Sometimes our inner world is bright and sunny .. sometimes it is overcast and sometimes it is all hail and lightning bolts, but we understand that our inner weather is constantly changing, and mindfulness shows us that our emotions are also transient and we can (with practice) watch them approach and pass without getting caught up or propelled by them. RAIN has been shown to be extremely helpful in handling some of the challenging emotions, sensations, and thoughts that might bring us suffering. A ~ Acceptance or allowing that whatever we are experiencing is okay. Agreeing to be ok with it. We might wish to stop unpleasant feelings, but by accepting what is present, a quality of allowing and healing can arise. I ~ Investigation of where you feel the emotion in your body and discovering how it manifests itself. When in the midst of a strong emotion – what do you notice in your tummy, chest or face? Vital to this step is inquiry with a quality of kindness and gentleness. N ~ Non-Identification comes about naturally when we recognise that it is THE EMOTIONS causing us suffering, not OUR emotions causing suffering. We no longer take our emotions personally but recognise ‘this too shall pass’. * You might then bring a sense of awareness into your body by noticing where you sense the touch of the chair or floor on your body, just notice. * As you begin to relax and your breath begins to slow, can you notice a place in your body where there is a lightness and ease? Finding somewhere in the body where we notice a pleasant or neutral feeling, gives us a place of refuge, somewhere to rest for a few moments and relax. * During your meditation practice if you recognise a strong feeling or emotion, can you give it a label that describes the content .. fear, anger, sadness. * Is it possible to accept the emotion? Is this emotion ok to feel? If not, you might ask yourself, how do I feel about this emotion? Continue to recognise the emotion for a few moments, then return to the pleasant/neutral area of your body and just breathe. You might do this a few times .. recognising the emotion and then returning to the space in your body that is calm and relaxed. * You might then move on to investigation .. where do you feel the emotion in your body? can you sense what you feel in your belly, chest or face and keep breathing? After some investigation return again to that part of your body that you felt was pleasant/neutral for a few moments, then again return to where feel the emotion. What sensations do you notice? Are these moving or changing? Be kind and gentle with what you find, and then return to your pleasant area, moving back and forth as necessary. * the last step is non-identification. Can you not take your current emotional state, personally? Could this be ‘that emotion’ rather than ‘your emotion’? .. just notice before returning to that pleasant part of your body and let your attention rest there for a while. * To finish bring an overall sense of peacefulness and ease to your mind and body. Bring some loving-kindness to your meditation, before gently returning to your day.